The Calling of Peter and Andrew, Mosaic, 6th century, Basilica of Sant’Apollinare Nuovo, Ravenna, Italy. Calculation and rationality can only take us so far when it comes to following Christ. Every now and then, Christ calls us to do something which may, to others, seem a bit imprudent. Consider the disciples in today’s Gospel. There they were, Simon and Peter, James and John enjoying another humdrum day at the nets, when Jesus summons them to follow him. And they drop everything and go. Can this possibly be sensible – leaving the security of their trade, abandoning their family responsibilities? Surely the prudent person would have been more like the young man in Luke 9:61, to whom Jesus says, ‘Follow me’. What about the rich young man in Matthew 19:21-22? The young man said to him, ‘I have kept all these [commandments]. What more do I need to do?’ Jesus said, ‘If you wish to be perfect, go and sell your possessions and give the money to the poor, and you will have treasure in heaven; then come follow me.’ But when the young man heard these words he went away sad, for he was a man of great wealth. Jesus is asking him to do what the world might consider foolish and reckless. Surely that was imprudent! Shouldn’t she have kept something aside for herself? Part of the difficulty in our understanding is that our use of the word prudent in contemporary English has shifted. It now has overtones of cautiousness, whereas the traditional usage is much richer than that. Prudence is the ability to decide where an act is on the sliding scale from those acts which are cowardly, over-cautious and self-protective to deeds which are reckless and needlessly risky. Somewhere in the middle of these two extremes are acts which are courageous. Too much caution will make you immobile with fear; too little caution and you may end up in hot water. But Jesus doesn’t seem to mind people making radically incautious choices when it comes to his Kingdom. So we have to rethink Prudence in the light of an act’s service to the Gospel. That is why the disciples’ leaving their livelihood, or a person giving his money away to the right cause, or being willing to die rather than renounce his faith, can, in God’s eyes, be supremely prudent. But prudential decisions are not made merely in a dry, analytical framework. Today’s readings give us a glimpse of the audaciousness, surprise and joy that accompany a radical decision for Christ. It’s not easy to describe the inner landscape of a person who has been illuminated by the Holy Spirit. But it’s as if one now inhabits a mental universe where all things are possible, where the most tricky situations can be entrusted to a loving Father, where self-forgetfulness replaces self-consciousness. There’s something about Jesus that has enlightened the disciples on this day by the Sea of Galilee and stirred up the courage and the passion to abandon themselves to his plan. If we look at the lives of holy people, we can get a sense of their joyful, incautious abandonment to Christ. St Francis of Assisi .. gave up the opportunity to live a life of luxury as the son of a silk merchant, and devoted himself to spreading the Gospel through preaching, living the same life of poverty as the poorest of the poor and restoring several ruined churches. St John Bosco … had a bold idea to help street children and unemployed boys to find work, safe lodging and a grounding in Christ. Despite his almost constant lack of resources, he worked tirelessly to establish his Oratory and trusted in God to supply their needs. St Katharine Drexel … gave up her seven million dollar fortune to join the Sisters of Mercy and found the Sisters of the Blessed Sacrament, providing schools and missions to native Americans. St Damien of Molokai … gave up his personal comfort to share his life with the quarantined leper colony in Hawaii, building schools, roads, hospitals and churches to provide for their material and physical needs. Mother Angelica … despite knowing nothing about broadcasting, had a bold vision to evangelise through television and, starting from small beginnings, went on to develop EWTN, the largest religious media network in the world. Let’s try having a conversation with God today about his purposes for us – he might be about to inspire us to do something joyfully bold for his Kingdom! Categories: Mass readings | Tags: 3rd Sunday, Abandonment, Counsel, Jesus Christ, Prudence, Virtue, Year A | Permalink. St John the Baptist in Prison, Juan Fernández de Navarrette, 1565-70, Oil on canvas, 80 x 72 cm, The Hermitage, St. Petersburg, Russia. This makes us wonder: what was the nature of the long-awaited Messiah that the Jews were expecting? Was it a King who would bring about the restoration of Israel and liberation from the Roman occupation, or were they expecting God Himself to arrive – or was it a bit of both? We know that swirling through the air of first century Judaism was a fever of expectation. That is why ‘all of Judaea’ (Mt 3:5) had been so willing to go out to the desert to see John the Baptist and prepare the way of the Lord. What made the Jews so convinced about the timing of the coming of the Messiah? According to the prophecy in the book of Daniel, the kingdom that would be ushered in by the Messiah – the Anointed One – would arrive in the midst of the fourth empire after the Babylonian deportation. In Daniel’s prophecy the empires are represented by the parts of a statue. These four empires were, successively, golden-headed Babylon, silver-chested Medo-Persia, bronze-thighed Greece and finally, in 63 BC, with Pompey’s capture of Jerusalem, iron-legged Rome marched into the Middle East. And it is into the Roman Empire that Christ comes, proclaiming the Kingdom. Yes, the Roman soldiers were clad in iron, but God has a way of using small stones to bring down giants, and the Jews remembered their history. Not only that, but the Jews could even calculate the approximate time the Messiah was expected. This is why small communities of Jews such as the Essenes of Qumran had set themselves apart, purifying themselves to hasten the coming of the Messiah. The message that the prophecy refers to, is the rebuilding of Jerusalem after the Babylonian exile. You can calculate the dates if you understand that the weeks are “weeks of years”, i.e. seven year periods. Then the seven weeks and sixty-two weeks add up to 69 weeks of years, i.e. 69 x 7 = 483 years. Jerusalem’s walls were restored by Nehemiah in about the fourth decade of the fifth century BC, “the twentieth year of the reign of Artaxerxes” (Ne 2:1; 5:14). So, if we use the Babylonian method of reckoning years as 360 days, we arrive at the coming of the “Anointed Prince”, just about at the time of the beginning of Jesus’ public ministry in AD 28. And Jesus says, “Go back and tell John what you hear and see; the blind see again, and the lame walk, lepers are cleansed, and the deaf hear, and the dead are raised to life and the Good News is proclaimed to the poor; and happy is the man who does not lose faith in me” (Mt 11:4-5). The fact that these miracles occurred long ago, is no reason for them to be deemed unconvincing or just fables. Jesus’ miracles are well attested even by non-Christians such as Josephus, who said “For he was one who performed surprising deeds” (Jewish Antiquities, 18.3.3 §63). Then there’s the Babylonian Talmud, (a Jewish text and therefore not pro-Christian), which described Jesus thus, “He is going to be stoned, because he practiced sorcery” (Babylonian Talmud, Sanhedrin 43a). That is, he did things that are, humanly speaking, impossible. If you’re interested in other ways Jesus fulfills prophecy, Taylor Marshall has come up with a comprehensive list in his book, The Crucified Rabbi. There’s a list here: prophecies-fulfilled-by-jesus-christ. In this science-obsessed age, it’s a wonder that more people don’t bother to ‘go where the evidence leads’ where Jesus is concerned. Blessed indeed are those who do not find Him a cause of falling. Categories: Mass readings | Tags: 3rd Sunday, Advent, Biblical prophecy, Jesus, John the Baptist, Proof, Year A | Permalink. 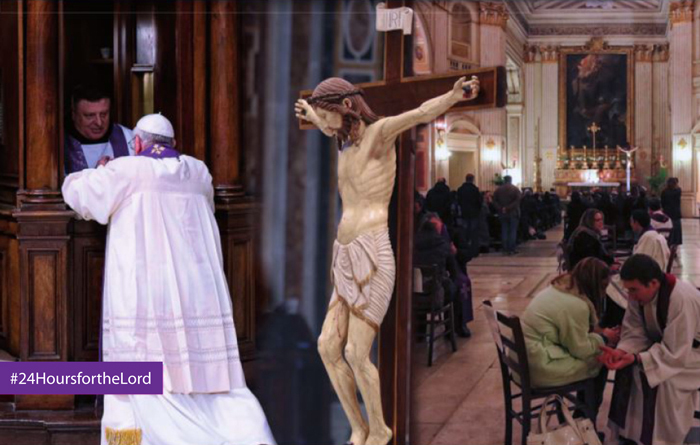 3rd Sunday in Ordinary Time, Year C |Repent! What me? How dare you. Christ preaching in the synagogue, fresco, ca 1350, Visoki Decani Monastery, Kosovo, Serbia. On the other hand, what does Pope Francis actually say? The Church condemns sin because it has to relay the truth: ‘this is a sin’. But at the same time, it embraces the sinner who recognises himself as such, it welcomes him, it speaks to him of the infinite mercy of God. Jesus forgave even those who crucified and scorned him. To follow the way of the Lord, the Church is called on to dispense its mercy over all those who recognise themselves as sinners, who assume responsibility for the evil they have committed, and who feel in need of forgiveness. The Church does not exist to condemn people, but to bring about an encounter with the visceral love of God’s mercy. I often say that in order for this to happen, it is necessary to go out: to go out from the churches and the parishes, to go outside and look for people where they live, where they suffer, and where they hope. I like to use the image of a field hospital to describe this “Church that goes forth”. It exists where there is combat. It is not a solid structure with all the equipment where people go to receive treatment for both small and large infirmities. It is a mobile structure that offers first aid and immediate care, so that its soldiers do not die. It is a place for urgent care, not a place to see a specialist. I hope that the Jubilee [The Holy Year of Mercy] will serve to reveal the Church’s deeply maternal and merciful side, a Church that goes forth toward those who are “wounded,” who are in need of an attentive ear, understanding, forgiveness, and love. Corruption is the sin which, rather than being recognised as such and rendering us humble, is elevated to a system; it becomes a mental habit, a way of living. We no longer feel the need for forgiveness and mercy, but we justify ourselves and our behaviours. Jesus says to his disciples: even if your brother offends you seven times a day, and seven times a day he returns to you to ask for forgiveness, forgive him. The repentant sinner, who sins again and again because of his weakness, will find forgiveness if he acknowledges his need for mercy. The corrupt man is the one who sins but does not repent, who sins and pretends to be Christian, and it is this double life that is scandalous. The corrupt man does not know humility, he does not consider himself in need of help, he leads a double life. We must not accept the state of corruption as if it were just another sin. Even though corruption is often identified with sin, in fact they are two distinct realities, albeit interconnected. Sin, especially if repeated, can lead to corruption, not quantitatively — in the sense that a certain number of sins makes a person corrupt — but rather qualitatively: habits are formed that limit one’s capacity for love and create a false sense of self-sufficiency. The corrupt man tires of asking for forgiveness and ends up believing that he doesn’t need to ask for it any more. We don’t become corrupt people overnight. It is a long, slippery slope that cannot be identified simply as a series of sins. One may be a great sinner and never fall into corruption if hearts feel their own weakness. That small opening allows the strength of God to enter. When a sinner recognises himself as such, he admits in some way that what he was attached to, or clings to, is false. The corrupt man hides what he considers his true treasure, but which really makes him a slave and masks his vice with good manners, always managing to keep up appearances. In the reading for today from Nehemiah, the people of Israel are overcome with repentance. For the people were all in tears as they listened to the words of the Law. They realise how far from the Lord they have been, and are overwhelmed with sorrow when this knowledge comes upon them. But Ezra tells them, “Do not be sad: the joy of the Lord is your stronghold.” It is only after we experience that metanoia, that we can participate in the Jubilee that flows out of it. Prayer: Father God, help us to avoid the pride that makes us justify our self-sufficiency. Help us to develop habits of humility and self-examination. Help us to turn towards you daily and find peace and communion with you. For a scripture study on today’s readings – including the historical background – read Dr John Bergsma’s commentary at The Sacred Page. Bishop Barron takes this from a different angle – the importance of building our religious identity – in Walls and Bridges. Categories: Parish Newsletters and Readings, Uncategorized | Tags: 3rd Sunday, Ezra, Forgiveness, Mercy, Nehemiah, Ordinary Time, Pope Francis, Repentance, Salon Magazine, Year C | Permalink. The Resurrection, showing Christ raising Adam and Eve, Greek Orthodox Byzantine Icon, egg tempera on wood panel. And for a scripture study on today’s readings go to Dr Michael Barber’s commentary here. Categories: Conversion, Parish Newsletters and Readings | Tags: 3rd Sunday, Atheism, atheist, Conversion, Easter, Resurrection, third sunday, Year B | Permalink. 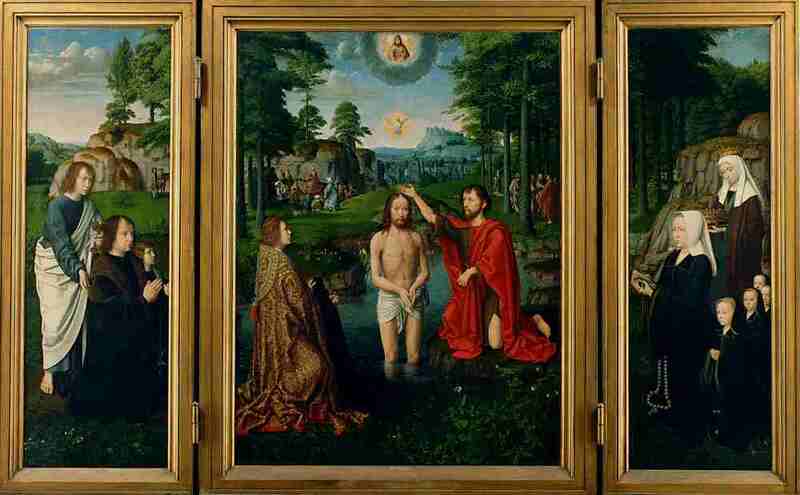 Baptism of Christ, altarpiece, triptych, oil on wood, Gerard David, ca 1507, Groeningemuseum, Bruges, Belgium. Categories: Parish Newsletters and Readings | Tags: 3rd Sunday, Advent, Euangelion, Gospel, Readings for Mass, third sunday, What is the Good News, Year B | Permalink.